How do I e-prescribe a controlled substance? This article assumes you know how to e-prescribe a non-controlled substance, and select a patient's pharmacy. If you'd like to learn how to do those things, please read this article first. You may watch a video of how to e-prescribe a controlled substance, and/or read on below for step-by-step instructions. 1. 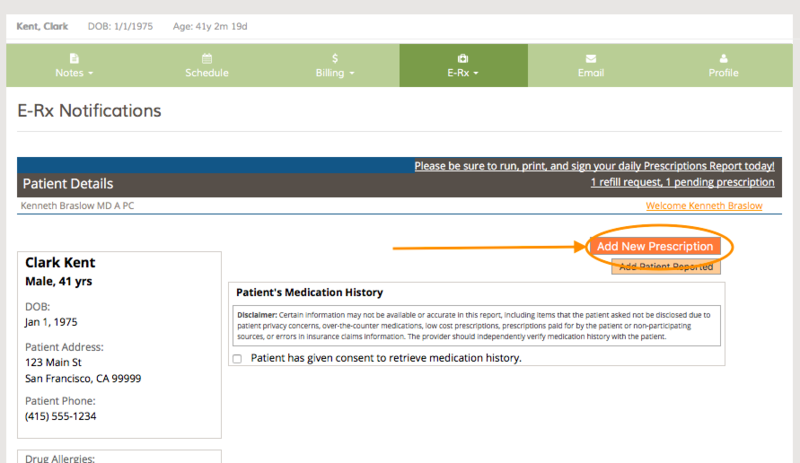 In any patient/client's chart in the EMR, click on "Rx > Send Rx". 2. 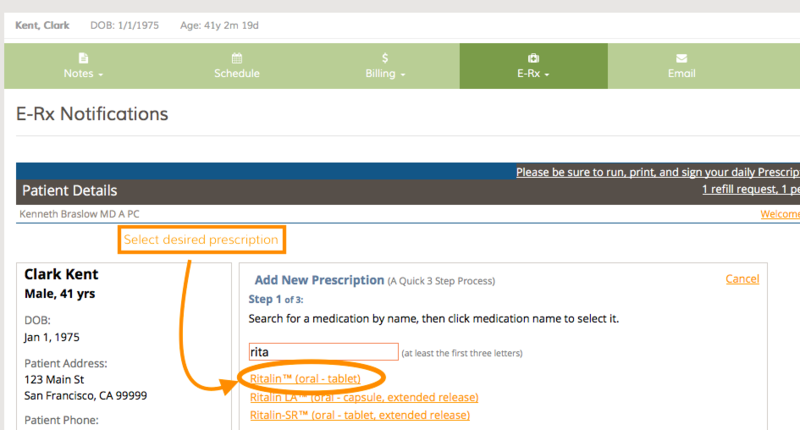 Click on "Add New Prescription"
3. Start typing in the name of the medication, at least the first three letters. As you type, the system will narrow down your options. In this example, we'll e-prescribe ''Ritalin''. Type "Rita"... 4. You'll see three possible choices. Click on the desired medication. 5. Click on the desired dose. 6. Enter the directions, quantity, and refills, just as if you were prescribing on paper. Check the box "No substitutions" if you want the Rx to be dispensed as written. Note that "Effective Date" (in MM/DD/YYYY format) and "Days supply" is required for C2s. Click "+ show pharmacy notes" if you'd like to send a message to the pharmacist. Then, click ''Save Prescription''. 7. You will now see the prescription "queued up." If you haven't selected pharmacy yet, you will have to do that first (See step 7 here for a reminder on how to do this). 8. If no changes are desired, check the box next to each prescription you want to send (you may send multiple prescriptions at the same time). 10. 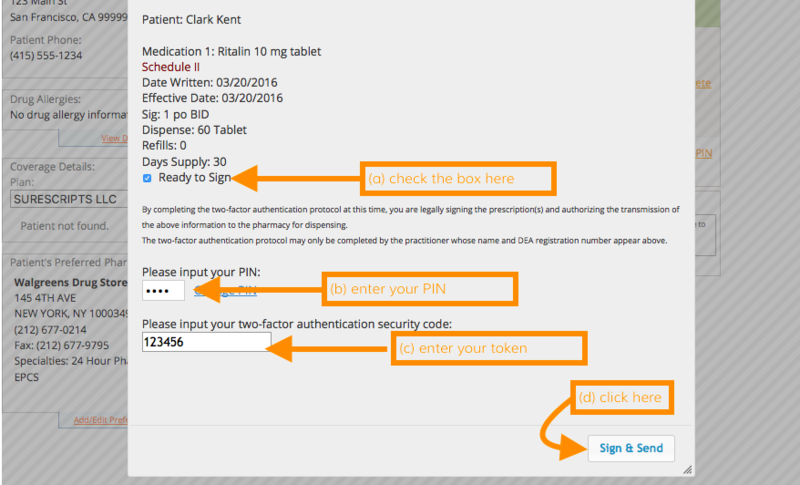 Now, a) check the box again (yes, again) next to the controlled substance you wish to e-prescribe, b) enter your PIN, c) your six-digit token found in your smartphone "VIP Access" app or on your hard token and d) click "Sign & Send." 11. And you're done! You'll now see the prescription in the "Active Medication List." Once the e-rx has been successfully transmitted, you'll see the status change to a green check mark. The patient's medication list will be automatically updated in ''Rx > Rx History'' as well. Want to use Send E-Prescription feature? Upgrade now.